Home / Editor's Choice, Entertainment News, Featured Articles, Gossip and Drama, Videos / BUSTED! See where this Kenyan prison warden had hidden cigarettes that he was sneaking in to the inmates (VIDEO). BUSTED! 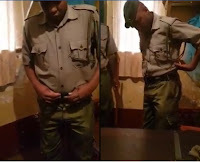 See where this Kenyan prison warden had hidden cigarettes that he was sneaking in to the inmates (VIDEO). Monday, September 10, 2018 - This rogue prison warden was caught red handed hiding cigarettes in his clothes. He was sneaking in the cigarettes to inmates. But on this day, he was not lucky after his boss caught him red handed.